Are you looking for an exciting kayak adventure to beat the summer heat? 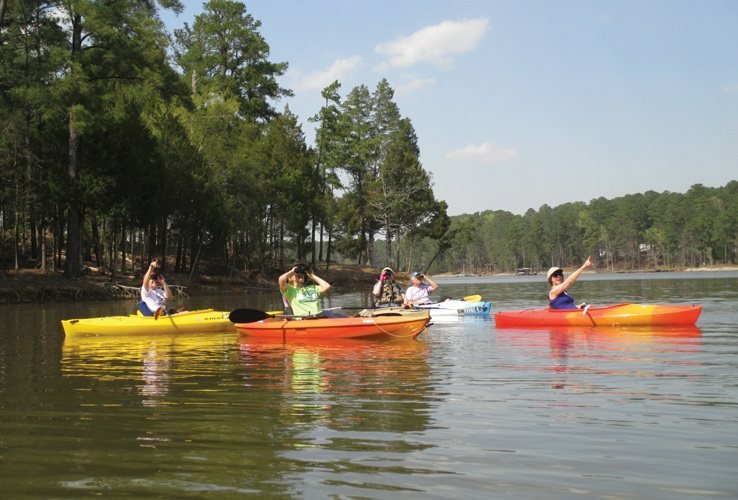 The Savannah Lakes Outdoor Adventure Club is coordinating a trip to The Sandbar in Bowman, GA to kayak the Broad River. When: We will plan to meet at the SLV Recreation Center on July 8th and leave at 8:00 am. The outfitter will provide kayaks, paddles, and vests so there is no need to bring your kayaks. The river is not deep and there are a lot of rocks so it is better to use their kayaks for this adventure. The best way to travel will be to carpool and caravan to The Sandbar. I will print maps for anyone interested in traveling separately. Driving time will be approximately 1 hour and 20 minutes. This will get us on the river around 10:00. We will finish by 3:00 in the afternoon. Where: The Sandbar is located at 3435 King Hall Rd, Bowman, GA 30624. We will park at their office along the river and they will collect your money and shuttle kayakers upriver. From there, we will paddle back to their office where we can shower, change, and drive home. They have a small snack bar and some supplies in their store. The paddle takes an average of 3 1/2 hours to complete so plan your snacks accordingly. The river runs at a good pace so paddling is mostly to keep you pointed downstream and to direct you through the rapids. The river is shallow and you can stand in most places. This is a beautiful river and provides a river experience with rapids that can be paddled by people of all experience levels. Great activity for your visiting guests to experience. Don’t worry, everyone can handle this trip! You may call or email Tom Green at 706-318-9495 TomGreene@wctel.net if you have any questions or would like to go on trip. This looks awesome. Is it still running? You may be aware that some members have taken to Go Karts in an attempt to recapture their lost youth. We have had two events and are planning a third for Friday, May 17. We have ten signed up; the limit based on the number of rental karts available. We have also planned a Driver’s Meeting to review high performance driving and car control, while having a great deal of fun. It will address track protocol including choosing a line, holding a line, giving up a turn, braking point, apex, on the throttle, passing, etc., and a Q & A session. We will call it ‘Road Racing 101’. You are invited to attend this meeting even if you cannot join us at the track this time. A brand new, fun, family event for all ages, Circus Stella, a one ring circus featuring husband and wife performance team Dextre Trip & Jayna Lee along with their performing puppies, Stella, Adrian, Louise, & Rozi. All of the dogs featured in the show are mixed breed rescue dogs from various humane societies. Circus Stella has performed on a variety of TV shows such as America’s Got Talent, The Ellen Degeneres Show, NBC’s The Today Show, CBS’s The Early Show, and MTV Music Awards. With aerial silk, rope walking, trapeze, ladder balancing, juggling, unicycle, and stilt walking this show is sure to be a captivating crowd pleaser. Tickets are $5/Child $10/Adult, or $25/Family of Four. Group rates available for churches, schools, and other organizations. It is ALMOST time for Circus Stella here at PTC and we CAN’T wait! We hope that you’ll support this fantastic family event here at the college this Saturday! Bring children, grandchildren, and friends. It’s great fun for all ages!! We will have concessions available with yummy circus food (like popcorn and cotton candy!). A portion of the circus’ proceeds will be donated to assist various animal shelters in caring for their animals! So you ate the chocolate bunny, peeps, and jelly beans, I have a perfect evening of exercise for you. Come out to McCormick Country Club Wed. and work those extra pounds off and dance. We are doing all kinds of dancing line ( I need to learn some of these line dances), twist, free movement, whatever you want. Bring snacks or whatever for your table or share. BYOB. $5/person cover. Doors open at and Rhonda sings from 7-10. We will have 2 big events to celebrate (we love to celebrate) Cinco De Mayo and Mother’s Day. If there is any other event; Birthday, Anniversary, whatever, we are in. Come out and enjoy the party at MCCheers. It’s an exciting, riveting mystery comedy. It is time to dust off your saddle shoes, press your poodle skirts and practice your jitterbug! The Humane Society is hosting a rock and roll night on Saturday, June 8th at the Hickory Knob Barn. Our DJ’s will be playing all of your favorite 50’s music including Frankie Valli, The Imperials, and the The Drifters. Mark this special event on your calendars and come dance, sing and reminisce! More details to follow at a later date. and Sunday, March 24, 2013 @ 11a.m. You are ALL invited, FREE of charge, for a wonderful choral performance heralding the Easter season. My husband and I want to thank all the First Responders who came to our house Monday night so quickly after my father became very ill and needed to be transported to the hospital. Right after my husband dialed 911 they were at our house. The paramedic that stabilized him took great care of him. We are so lucky to have so many caring and compassionate professionals in our community. BOUGHT YOUR TICKETS YET ?? Something new at Rotary’s 12th annual Casino Night will be TEXAS HOLD ‘EM (one table only)at Long Cane Center (Red Barn) at Hickory Knob State Park on Saturday, March 23RD, 2013, from 6 PM to 9 PM. If you like Texas Hold ‘EM plus other games of chance, this is for you! We will offer Craps, (Yes, we’re expecting Nate Andrews, your favorite, to be there), Blackjack and Pony races for your entertainment. Door prizes will be awarded every half hour. Only 100 tickets will be sold and we will give away at least 33 door prizes. One in three ticket purchasers will win! Free hot and cold hors d’oeuvres will be provided throughout the evening and a cash bar will be available. At the end of the evening, you can use your “winnings” to bid on auction prizes;ŠElectronics, Dinners, Artwork, Vacations, and more. A Major Jewelry prize will be awarded to some lucky ticket holder. A Necklace? A Bracelet? A Ring? A Diamond? All these have been awarded. All proceeds benefit McCormick children’s activities such as: The McCormick Library Playground; McCormick Girl Scouts & Brownies; McCormick Boy Scouts; McCormick High School Army Junior Reserve Officer Training Corps (AJROTC); Dictionaries for all third graders;Š and much, much more. For $30, you and your friends can get all this excitement, plus “$10,000” In-House Credits for gaming. Casino Night is always fun and exciting for everyone, but best of all, you will be supporting a worthy cause. Tickets are all advance sales. No tickets will be sold at the door. Tickets will be available in February. For more information, or to purchase tickets, please contact Rotarians Bill West (852-9301), Anne Barron (852-2835), Jim Morrow (391-2810), or Karen Hoyt (391-2265). SAVANNAH, Ga. – The U.S. Army Corps of Engineers (USACE) Savannah District will host two turkey hunts in the Bussey Point Wildlife Management Area at J. Strom Thurmond Lake in the spring of 2013. The management area will be opened to all hunters on April 5 and 6. On April 13, the Corps will host a youth hunt. Hunts will be limited to 10 individuals daily. Hunters who are selected may bring a guide or guest. The guest will not be allowed to carry a weapon. To participate in the drawings, hunters must submit a letter requesting consideration for the hunt and should include the desired hunt date, the hunter’s name, mailing address and daytime telephone number, and mail to: Ken Boyd, U.S. Army Corps of Engineers, J. Strom Thurmond Proje ct Office, 510 Clarks Hill Highway, Clarks Hill, SC 29821-9703. Requests for consideration may also be sent by email to kenneth.h.boyd@usace.army.mil. Submissions must be received at the Thurmond Project Office by 4:30 p.m. on March 20. Shotguns may be used for all turkey hunts. For the youth hunt on April 14, hunters must be 15 years of age of younger and must be accompanied by an adult. The adult must be licensed in accordance with the Georgia hunting regulations and will not be allowed to carry a weapon. The hunts will begin each day one hour before sunrise and conclude at noon. Late arrivals will be denied entry. All applicable Georgia hunting regulations apply. Visitors who are not hunting are asked to find other recreation areas to use during the scheduled hunt. For additional information, contact Ken Boyd at the J. Strom Thurmond Project Office at 1-800-533-3478 extension 1159 or (864) 333-1159..
About 4:00 PM today, I was about 1/2 mile in on the Rails to Trails hiking path coming from the Barksdale Ferry entrance when my dogs and I came upon a large black bear with her two half-grown cubs. They were basking in the sun right in the middle of the trail. Silly me! I thought bears would be hibernating in a den at this time of year. As soon as I saw them, they saw me. We were perhaps 50 yards apart. I immediately started backing slowly away and pulling my dogs along with me. Momma Bear made a sound like a man coughing and stood up. She started walking slowly in the opposite direction and her cubs followed. She kept looking back to make sure we were really leaving the area. As soon as she was out of sight, we practically ran all the way back to my car. That was a confrontation I wanted no part of, dogs or no dogs! Folks, if you decide to walk in the woods alone, keep your eyes peeled. You never know what you might find. For want of a better idea, I’m thinking about carrying one of those loud air horns they use for boating emergencies or sailing in a fog. Any bear experts with suggestions? Online reservations for Tennis courts are up, up, up! This great new feature to newly formatted website will give you the ability to make a tennis court reservations, If you haven’t yet started making your reservations online, now is the time to give it a try! Immediate confirmation, followed by an immediate email confirmation for your records and scheduled players in your group. 2. Timeliness in making a confirmed reservation, no more waiting for a staff member to receive your voice mail or email, and wondering if it was received. 3. Ease in making changes without calling the Recreation Center. 4. The ability to make your court reservation at midnight in your pajamas, when the Recreation Center is already closed and you forgot that your father-in-law is visiting tomorrow! The ability to see which of your friends are already playing and when! Ability to send your guests an email confirmation of your court reservations. Of course we still continue to take reservations by phone to accommodate those Members who prefer that method, but we encourage you to try out the new online reservation system; we’re sure that you will find it fast, accurate, and easier than leaving a voice mail or sending email. Once you log into the website, http://www.savannahlakes.com please use your username and password: username: johndoe, password: johndoe to log into the member side of website. Please be advised that each member spouse has their own unique username and password, and it is important that we have an email address on file for each member adult. Located under ” Living in SLV ” you will see a tab titled “Book a Tennis Court.” This is where you can book a tennis court and look to see how many courts are already reserved at any given time. **Online court reservations are available 7 days in advance. Established Standing Reservation Groups must provide names of players 24 hours in advance to keep court reservation block. For a demonstration on how to make a reservation for the different areas, click on the below tutorial links. Also, click here for step by step instructions on booking procedures. We welcome your feedback on our new online reservation system! Let us know what you like. What do you think could be improved? Keep your suggestions coming! We had a great time last week, and will dance, laugh and celebrate again this week. Each week will be similar but with different music and moves each time so you can drop in any time. This relaxed workshop combines a variety of dance forms done at your own pace. The movement is inspired by modern, jazz, ballet, belly dance and free interpretive movement. Taught by Angelina Richter. Wear comfortable clothes, bare feet or shoes, avoid slippery socks. Nominal fee to cover expenses $4. No registration needed “walk right in” and dance. All of SLV is invited to come out and enjoy a great night of food, fun and one of the best blues singers in the area. Pam Bowman, who has entertained before at Tara’s House of Blues, is sure to treat us to a night we will remember! And the best part is she is only $10 for your entertainment pleasure. If you would like to join us for the buffet dinner then your entire ticket is only $30. This venue is being sponsored by the SLV Tennis Committee and a small portion of our tickets will be going to our Sectional Champs – The Lady Lakers – to help defray some of the cost as they go to Surprise, Arizona to compete for a National Championship! IT’S ALMOST SPRING! COME OUT AND TAKE A SWING! Thursday January 31 @ Monticello. PLEASE be signed in by 10:30 for an 11:00 Shot Gun Start. If you have prearranged your group, please wait to sign in until everyone is present. No need for membership or handicap. Great time to get those scores posted for a WGA Handicap. League begins in March. Class) beginning February 5th. There is still time to enroll. are all about) please contact Doug Chalifour 391-8497. So many are wanting these aquatic gloves and shoes that I am getting together a large order so that we get freeship for Speedo Aquatic Mitts with velcro close and open fingertips (S, M, L, XL) and Ryka (women’s) Aquatic athletic shoes. Both these items are the top quality available in aquatic equipment, for a discounted price, good choice of colors, and whole plus half sizes in shoes. The shoes are about $60, the gloves about $20, depending on how many are ordered (the more, the lower). They last more than twice as long as other brand equipment if they are rinsed in cool tap water and dried after each use. Sign up sheet for all your info at the AC front desk, or you can email me directly. Will place order in a couple of weeks around Feb. 4. Gloves offer both buoyancy and huge resistance equivalent to foam dumb bells if you use them correctly, and supportive athletic aquatic shoes are necessary equipment for anyone doing vertical aquatic exercise in shallow to transitional depth water (mandatory for diabetics), adding stability, intentionality, resistance and muscularity to all movement down and through the water. 1. Mobile Mammography van is coming to SLV Recreation Center on February 5th. University Hospital Breast Health Center will provide women with quality digital screening mammography exams. Appointments will be made every 10 minutes at Recreation Center front desk. You will be required to complete registration form and make a scheduled appointment by Monday, January 28th. Each participant must bring a copy of their insurance card and valid ID at the time of the mammogram. 2. Stretch & Tone class time change. The new Wednesday Stretch & Tone start time will be 7:45am to allow for easier transition between classes. DEADLINE IS WEDNESDAY, JAN 9th to get your hat in the ring if you’re interested in being involved in SLV Community Theatre’s upcoming SPRING PLAY. The play is a comedy thriller called “A Tomb With a View” by Norman Robbins and we’re sure our SLV audience will love it’s great plot, comedy aspects, action and intrigue. The performances are March 16th, 22nd and 24th. There are 4 male and 6 female acting roles, some larger, some smaller. There are also many other functions involved including: Lighting tech, sound tech, stage manager, set design and building, art work, props and several other backstage roles. If you are interested in discussing or auditioning for an acting role or any backstage functions or tech areas, please email me before Wednesday, Jan. 9th and we will schedule an audition for you or a meeting to discuss your interests. We all know many very talented people in our Village personally and we heartily encourage you to join us. And if you’ve never done any of this before, but think you’d like to, we’ve all been there and we’ll be glad to work you in. Please email or call me right away if you’re interested. FYI for those who use Nitrogen in their tires or have an interest in using it. I had noticed that the tire store going into Lincolnton (from McCormick) advertised having available hydrogen. I went in today and sure enough they had it at a very reasonable prize. I had one tire low and they fixed the reason it was low and topped off the other three. The cost was $10 a tire. The good part is that they will top off the tires for the life of the tires for free. I have attached the store’s business card. I also found the store owner,Peyton, knowledgeable and very helpful. January 9 is the date for the next SLV book club discussion when Jeffrey Zaslow’s book The Magic Room will be the topic. This non-fiction selection tells the story of Becker’s Bridal shop in Fowler, Michigan, and some of the brides who chose their dresses there. If you or your daughter are a Becker’s Bridal bride, please contact me. I am looking for wedding photos of these brides with their fathers. All are welcome (Becker’s brides or not) to join us for a discussion of, as Zaslow says, “the love we want for our daughters.” We meet at 3:30 at the Activity Center on the second Wednesday of the month. Occasionally you need a reminder. Today is the day for any non-profits attending Board Recruitment and Development in Greenwood on the Nov. 28th to submit their RSVPs. Next week is Thanksgiving week and a lot of establishments will be closed Thursday and Friday in observation of the Thanksgiving Day holiday. The Chamber will be closed for those two days as well. If you want something sent out on Chamberlink it needs to be submitted early. There is always the community calendar on our website. While you are shopping don’t forget to pick something up for the Toys for Tots Drive at Michele’s. And last but not least. There will be another Identity Theft workshop at the Chamber on Monday Nov. 19 from 6-7:30 pm. Space is limited so call 391.2781 to reserve a seat. The Good Shepherd Men’s Club will be serving its all you an eat pancake breakfast on Sunday Nov. 11th from 800am to 100pm in the Church Parish Life Center on Hwy 221, North of town. Please come and enjoy a good breakfast and spirited fellowship. Help the Men’s Club continue its community efforts to aid those less fortunate than ourselves. Breakfast will consist of regular, blueberry and chocolate chip pancakes, hot and spicy sausage, peaches, juice and coffee. Cost is just $6.00 for adults and $3.00 for children under 12.
help provide some comfort to Hurricane Sandy’s victims. hour of your time would make a big difference. Food supplies, bottled water, etc., can be dropped off at the same site. runs over the next week or two, depending on our community’s response. Focal points can be used to add structure to your garden. They are the visual hinges of the garden design, the objects that draw the eye and lead the visitor towards them. A focal point can be achieved by careful planning, a well-chosen tree or a group of plants positioned to stand out in their surroundings. A birdbath or water feature, that prize winning “unique” piece you found and planted in from last months challenge, etc. A garden can only sustain a certain number however; a small garden perhaps one, and a larger one more, but in different areas. Keep in mind the proportions of the object to the size of your garden. What do you think of a fence? This is a great time of the year to construct one for your landscape. Fences can be open to show the view, or closed, to contain a space. It is essential that they should fit your garden and its setting. Some advantages are that they are cheaper than walls, quicker to build, and something that you can do yourselves. Think of two sections of split rail fencing at a ninety-degree angle in a corner of your yard. Now think of landscaping around it, fun. By cleaning used terra cotta containers before replanting or storing, you help prevent spreading plant diseases and pests. Use a stiff wire brush, scrape off soil and fertilizer residue, algae, and salt crust inside and outside the pot. Then scrub the pots with a 12-percent bleach/water solution and rinse well. To freshen up a pot, brush the surface with linseed oil using an old rag. These are so easy to make, and now is the time to be using the last of your herbs before they go to seed. Use 1 cup of fresh-picked herbs to flavor 1 quart of vinegar. You can use white, cider, or wine vinegar depending on your taste. Simply loosely fill a glass jar with clean herbs. Cover with vinegar and cap with plastic or a cork (don’t use metal). Store in a cool dark place for two to six weeks. Strain to remove the herbs when the flavor satisfies your taste. Nice to see you are doing the Garden Scoop Here! your social calendar and join us. Come out this Weds. to a Country Club in McCormick and dance to the music of our famous local singer. Bring your snacks and drink of choice. Doors open at 6 and the music starts at 7. Cover $8/person or $15/couple. We have a wonderful, roomy, clean environment to socialize and dance. HAVE YOU TAKEN A CRUISE TO SOUTH AMERICA LATELY? OK, that’s our plan … that is, visiting Brazil, Uruguay, Argentina and Chile on a Holland America cruise. We know about the visa requirements in Brazil (flying to Rio) and have gone through their multitude of hoops to obtain the visa. However, Holland America is unclear about entry fees in the other three countries. Those countries do not require visas but have “reciprocity” fees for U.S. citizens. Holland America believes these are only charged upon entry at the airport (a flight into the country). If you have been on a cruise and taken a shore excursion from the ship into any of these countries, were you required to pay an entry or reciprocity fee? BTW: The rules seem to change as fast as the weather. Thanks …. If you haven’t already done so, set aside Friday, October 26th for the Shenandoah Tailgate Party at Tara. Happy Hour will be from 4:30-5:30 and dinner ($13.83) immediately following. Flyers will follow as reminders. Be on time for the fun & games! Wear your favorite collegiate team football colors! It’s going to be a TAILGATE PARTY!! Call Shirley at Tara (Tuesday-Friday 10 -3) to make your reservation by October 20th. Your Shenandoah Cheerleaders will greet you at the door. Oh Boy! and through their efforts the car show has grown in participation from year to year. The proceeds from the car show are donated to Charity and the 2012 recipient will be the local McCormick Food Bank. in the competition (judged) we would love to have you participate. The important thing for this activity is to HAVE FUN. There will be a follow up email coming to you this Thursday as a reminder, as well as additional detail re. the event. Thank you in advance for your help. (Tim) of Michelle’s Pizza for giving us a nice break on the cost of the Pizza’s. Michelle’s owners are tremendous supporters of the McCormick Community. I would encourage you to support their establishment. activities (nothing heavy/strenuous). Some members have already stepped forward to lend a hand, and we appreciate that very much. I will be sending out reminders in the near future re. upcoming events that you may enjoy, so stay tuned. That’s all for now…Mary and I look forward to seeing y’all at the Gold Rush. The Humane Society of McCormick County is now selling tickets for a chicken dinner fundraiser to be held on Saturday September 22nd at the MACK Park. Meals are available for take-out or join the group and dine al fresco on provided picnic tables. Plates will be served from 12 noon until 2:00 and will feature a half of chicken, baked beans and Cole Slaw. Tickets are $9 each and advance purchase is required. Tickets are available in town at the Red Rooster or phone Jan Burttram 864-602-1513, Ron or Jude Cook 864-391-5414 and in the Barksdale Ferry area, Pauline Dain 864 391-4440. HSMC is a 100% all volunteer non-profit organization dedicated to saving the lives of stray and abandoned animals. Please show your support. Featuring: New Orleans Style Finger Food, Live Music & Dancing, Auction & Door Prizes! We look forward to seeing you at the annual HSMC fundraiser & can assure you of a fun evening, plenty of seating in a special McCormick landmark & the good feeling of helping so many cats & dogs in need in our own ‘backyard’. MCCC CHRISTMAS CONCERTS ARE ONLY FOUR MONTHS AWAY!! The McCormick County Community Chorus will be presenting their Christmas Concert at the AC on Thursday, December 6 (7:30PM) and Sunday, December 9 (3PM). .. Mark your calendars now!! MCCC will be starting rehearsals on Monday evening, September 10 at the McCormick United Methodist Church at 7PM and we’d love to have you join us!! There are no auditions, just a love of music! You decide what part fits you now.. Alto, Soprano, Tenor or Bass (Yes, some of our voices have changed over the years!) At the first rehearsal, we will be paying our dues ($10), collecting our music and catching up with each others news the first half hour and then start our rehearsal at 7:30PM. Do not feel you must become a member the first week, come by and join us and see how it feels. I have to warn you, you will be hooked! Jeanne is a lot of fun and very talented director who has a lot of patience to work with enthusiastic folks like us! I have personally become friends with lots of folks I would not have met otherwise, it is a good melting pot of not just SLV, but McCormick County (and some from Lincoln County). We are going to try something different this year and have rehearsals start at 7PM on Mondays and go until 8:30PM the first month, then re-evaluate if we like the change. That is a half hour earlier than we have been meeting and it might help with those having trouble concentrating since they are missing a kick-off on Monday Night Football or the latest Dancing with the Stars!!! Come, give it try.. it’s fun! And mark Dec 6 and 9 on your calendars right now!! The McCormick Children’s Home will have a benefit concert, featuring former Savannah Lakes resident Ora Poole (soloist), the Hilltop Strummers (from Canton, Ga.) and the Garden City Strummers (from Augusta, Ga) at 6 p.m. on Saturday, Aug. 18, 2012 at the Savannah Lakes Village Activity Center. A love offering will be taken for the children’s home. After the concert there will be a complimentary ice cream social. Ora Poole is looking forward to returning to McCormick where she has frequently sung for different occasions since she and her husband, Jerome, moved several years ago to reside in Canton, Ga. She still holds such affection for the people of McCormick and surrounding areas who so graciously opened their hearts and worked so hard to help settle her family into McCormick when they came here after Hurricane Katrina. Ora spends lots of time in Ga., now ministering in churches, senior citizen homes and doing concerts, sometimes along with the Hilltop Strummers. Her other love is tennis. The Strummers, a group of mountain, (lap/hammer) dulcimers, is a satellite club of the North Georgia Foothills Dulcimer Association. Most participants were new to this instrument, but all desired the opportunity to play this sweet music with others. Needing instruments, members built 24 dulcimers from kits. This kept the cost low for folks who wanted to try playing. The formula worked. The club has grown from three to more than 40 active members. For additional information, please contact Irena L. Webster, McCormick Children’s Home, Inc. at (864) 391-2931 or mchvcord@gmail.com. The Central Savannah River chapter of the American Sewing Guild, a national organization for sewing enthusiasts, is starting a neighborhood group in Greenwood. The first meeting will be August 29th at 1 PM in the Greenwood Library, 600 Main St., Greenwood. This event is free and area sewers of all interests and all skill levels are encouraged to attend. If you are unable to attend or need additional information please call Sue at 864-227-8175. For general information about ASG go to asg.org. The Kelley Family Bluegrass Band from Appling will perform a free concert at Hickory Knob in the Great Room on Saturday 8/4 from 7-8 PM. If you’d like to find out ways to have more fun, make your life more rewarding, deal with the negatives better, improve all your relationships, find new challenges, feel good a lot, be more positive and just plain be happier, come and be a part of our group. No experience necessary – (at being filled with joy) (sm). But people already happy are welcome too!! You might make others happier. We meet every first and third Tuesday at 11:30, for about an hour and a half. -Many people are the most grateful for loved ones and for the real satisfactions in life, not so much for material things. -There are so many ways to show appreciation and gratitude and it’s very important to express it to others. One little expression of appreciation can change someone’s life forever. -Receiving appreciation can be just as wonderful as giving it out. Think of an experience of expressing gratitude and another experience of receiving it from someone- so profound that you’ve never forgotten the feelings. -A letter or a phone call or even an email telling someone that you appreciate them or something they did can change someone’s day and leave you with a wonderful feeling. -Sometimes we’re most grateful for unexpected outcomes of situations that were not of our conscious choosing. -We show appreciation by taking care of ourselves, of others and of what we have. -Don’t look back at what might have been – it could have turned out worse. -We can be very grateful for the person we once were – that person might now be our best teacher. – Compose, add to and review often a list of all that you are grateful for. It comes in really handy on bad days. -We can be very grateful for our life’s path which took us where we never planned to go with people and experiences better than any we could have mapped out. -How often do we express deep, heartfelt appreciation to those closest to us? -Gratitude is an emotion ignited by thoughts and it changes every cell in our bodies, improves our health and the quality of our lives. Joy of LIfe Discussion Group meets tomorrow, Tuesday, July 17th at the Richters on Kingfisher Point. We’ve changed our time to 11:30 to accommodate people in yoga and other groups. LIVING A LIFE OF TRUE GRATITUDE. We’ll talk about how we can always find something to be grateful for, internalizing gratitude into our core, practicing changing our thoughts, finding good even in bad, sending out gratitude all around us, talking, thinking and being gratitude. We’ll explore how true gratitude will enhance our relationships, extend our lives, fill us with contentment, make our lives easier and help us deal with losses. We’ll dig into the many ways we can find things to be grateful for in the beauty around us and the people and wonders in our lives and our world and how focusing in those things in life can change our whole being. Hope you can join us. If you have guests, family, friends who’d like to come, they’re welcome too. Our meetings our held at our home on Kingfisher Point on the first and third Tuesday of each month at 11:30 A.M. Meeting usually last an hour and a half or so. All are welcome, including anyone in the Village or from outside of SLV. Each person is welcome to contribute to the discussion or not, as your comfort level dictates. There is no cost or obligation. Please RSVP by email if you’d like to attend. Being a new group and exploring new areas and ideas, we will be most open to other related ideas and suggestions to expand/improve our material and will be open to anyone who would like to provide a topic or lead any of the discussions. We’re also open to using all available resources to enhance our discussions. If fresh “wild-caught” SC seafood is on your grocery list or palette, you will want to check out a new seafood vendor on 378 across from the former Diane’s Creations. They are open on Thursdays from 11-6. He is a former shrimp boat captain himself, with contacts on the coast, where he is getting it on a regular basis, and they are friends of ours. They do the running for you, you get to enjoy it in your own home. We don’t think you will be disappointed! We hope you will try them. McCormick Chamber of Commerce office at corner of Gold and Pine street. business in McCormick can participate. 2012 Masters Champion, Bubba Watson has played golf in a Tournament right here at Savannah Lakes Village. One year prior to the beginning of The Savannah Lakes Classic which first took place in 2003 Bubba played in The 2002 DP Tour which was a developmental golf tour event played at our own Tara Golf Course. Chip Deason who also played in that event set the course record at Tara with a 62 and while we don’t expect Bubba to return Chip Deason from nearby Lexington, SC is listed as a participant in this year’s Savannah Lakes Village Classic. Purse. A full schedule of events will be posted on Neighborlink and listed on our SLV web site. Don’t forget to stop and see the Japanese Maple trees, various sizes, tomorrow between 9am and 6 pm in the parking lot next to the Village Store. They’re just beautiful and inexpensively priced! LYRA, the vocal ensemble from St. Petersburg, Russia, will make a return engagement at Good Shepherd Catholic Church in McCormick on Tuesday, May 1, at 7:30 p.m. If you attended their concert at Good Shepherd two years ago, you’ll recall their dynamic performance of selections from the Russian Orthodox Church, folk songs and classical music from Russian masters. The five members of the group are operatic soloists in their own right, and their appearance on May 1 promises to be as dynamic. Seating in the church is limited and we have sold more than 50 tickets already. So, don’t delay; order your tickets now because they will not be available at the door on the night on the concert. Prices are $15 each, two for $25. For tickets, call Dave Lorenzatti at 391-4339, Susan Davis at 391-5058; or the Good Shepherd office Tuesday through Thursdays between 9-3 at 852-4722. LYRA will be a unique treat you won’t want to miss. Celebrate spring with the Community Chorus! Your friends and neighbors have been having a grand time preparing for you a “Potpourri of Songs”. The program is full of chorus favorites from all across the spectrum. We have Broadway, sacred, road tunes and more. You’ll be sure to know most of the words, and will no doubt find yourself smiling and humming along to such classics as “High Hopes” and “New York, New York”. We even have guest musicians joining us, and several choir members offering special talents to round out the show. Tickets are just $6 for adults and $3 for students, and are available at the Activity Center desk, or from any chorus member. There are two performances – Thursday, April 12th at 7:30 p.m., and Sunday April 15th at 3 p.m.
Come on out and join the fun – it’s sure to be just the right mix of spicy, sweet, tangy and mellow – like any good potpourri! Spring is here! Need some incentive to clean up and clean out? The Humane Society of McCormick County would be happy to take these “treasures” off your hands once again. We could use anything, large or small for the May 5th yard sale at the Activity Center. If you are able to deliver large items that morning, it would be appreciated, as our storage space is limited (furniture, bikes, small appliances, etc.). Please contact me to arrange for pick up in advance of the sale, if you need assistance. As customary the Humane Society will have tables with a variety of items for sale. We know there are many worthy causes in need. Hopefully we can all spread the wealth. Whatever we do not sell, we donate locally. Your generosity last year brought in much needed revenue. Please consider donating to help continue ours efforts in our Spay/Neuter campaign and finding homeless dogs and cats a permanent home. Please attend the biggest yard sale in McCormick on Saturday, May 5th from 8am – 11am. Come early for the good stuff! Here is an email for a Mary Kay representative. Volunteers wanting to paint and participate in the Visitors Coucil Quilt Trail Project are invtied to “just show up” any or every Wednesday, 1pm, at our workshop headquarters in the Red Rooster on Maint St., downtown McCormick. It is casual, it is purposeful, and just plain FUN!! Just a BIG THANK YOU to all the ladies that came to lunch bunch yesterday! It was a truly a privilege to share with you my passion for Skin Care. While there may have been some misunderstanding in the beginning about the topic of Skin Care vs Cosmetics….I hope that you were able to glean something new and interesting to help you have healthier, happier skin. I loved your participation in the program…that’s what makes it fun for me. So, I’ll bet right now you are making your “Funny” faces, doing the exercises that we tried yesterday!!!! Remember…..all muscles are attached…so tuck those bee-hind muscles…smile..and take 10 years off your face! Happy Day! What do you know about The Declaration of Independence? It will be discussed on at 10 AM,Tuesday, March 27, 2012 at the Activity Center. Ellen Cook will lead the discussion. Everyone is invited to come hear what people have to say about the document. This is a Discussion Group notice. Im Steve , your ups man. for a big plant sell behind the Village Store. Hope to see you there! Steve~ Those are one of my most favorite trees. I call em “fire trees” 😉 I am extremely interested. Is there a way you could give me an estimated price? TIA. Submitted on 2012/03/27 at 3:06 PM | In reply to Steve. Steve~ Those are one of my most favorite trees. I call em “fire trees” I am extremely interested. Is there a way you could give me an estimated price? TIA. $25.00 to $75.00 Hope to see you around 9 a.m.
does sales and installation of garage door openers? Open to the Public 10:00 a.m. – 4:00 p.m. I have been an International Prison ministry called Kairos. I have been participating in it since 1994 or thereabouts. Its a total volunteer ministry and meets twice a year for training sessions for a 4 days preparation for service in the local Prison. We have two—2 day programs in the prison each year. We also meet with Inmate population who have graduated from the Kairos program the 3rd Saturday of each month. It is a very satisfying and rewarding program for volunteers to get themselves involved in. There are 6 of us villagers who are presently involved in this effort. We welcome all newcomers. Hi Libbi & Theresa…keep the Spa comments coming!!!!! I have been trying for 3+ years to get this going. If enough folks want this perhaps it will actually come to pass. Please give me an idea as to what type of service you would take part in and try to be specific. Example: Body Wrap; Salt Golw; Sugar Scrub; Facials; Microdermabrasion; Manucures and Pedicures; Massage (we already have that ofcourse); Hair Styling; Hair Removal..ie:waxing. Lets just keep trying to get this done!!!!! Always spread sandwich ingredients on bread before cutting edges – if you don’t there’s bread with nothing on it! Use an electric knife to take off edges. When baking cup cakes, cookies, most uncovered meats, turn pan half way through cycle – the back of oven is always hotter. Need to slice cake rounds? Use dental floss. Use a medium size punch bowl, add ice and you have a champagne cooler. Who know? Pair silver and silver-plate. Can also use pewter – it’s low maintenance. Don’t over-polish silver. Each time a thin layer of the surface is taken off. Create a pretty table. Gather throw away jars – jam, jellies, etc. Fill with candles of equal size or float votives; group on a pretty tray, maybe place a few pieces of greenery from your yard between the jars. Hurricane vases make beautiful containers for candles or flowers. Look in your china cabinet for footed, wide-mouth bowls – they work well with candles. Just make sure the top is wide enough for the candles you are using so they won’t smoke.